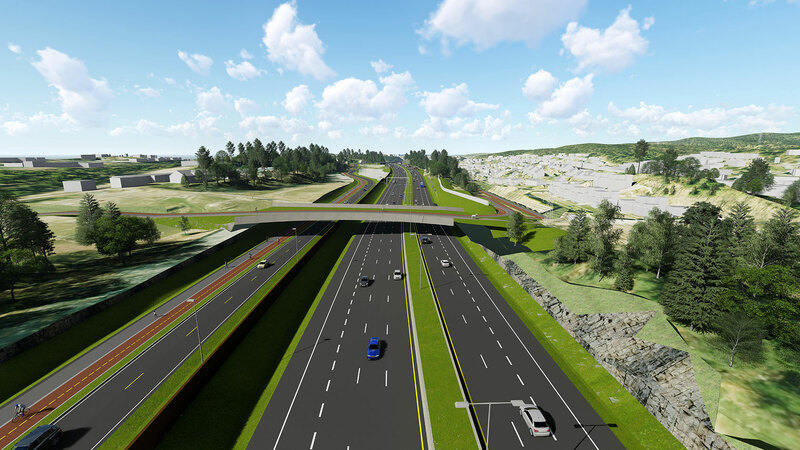 The purpose of the project is to develop a new main road system for the E6 in the southern corridor in Oslo, which will relieve congestion on Ring 3 between Ryen and Teisen. Noise and air pollution in the worst-affected residential areas along the current Ring 3 will consequently be reduced. Reducing the barrier effects is also one of the priorities. The future transport system will facilitate the use of environmentally friendly means of transport such as public transport, bicycles and walking, improve traffic safety and provide a predictable flow of traffic for businesses using the transport system. 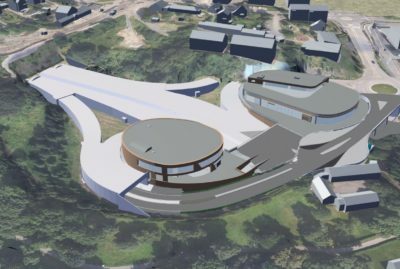 The project will support the objective of providing Bryn with a regional public transport hub. This will facilitate an urban development programme which will reduce transport needs and increase population density around important public transport hubs. 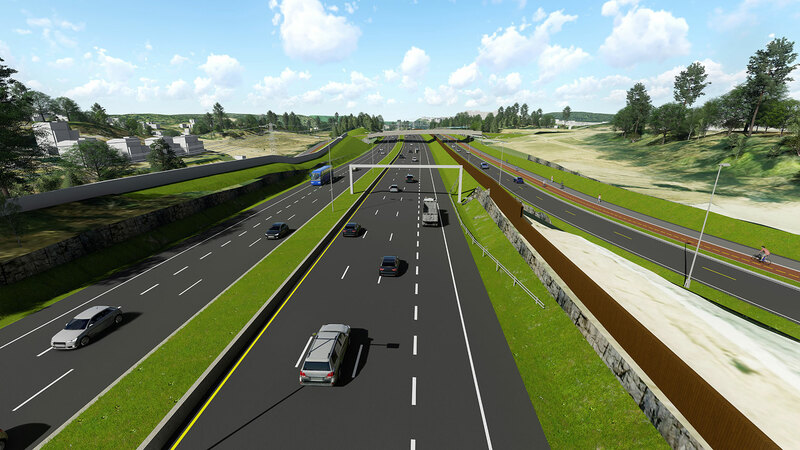 The project will support the objective of zero growth in private vehicle traffic. The Norwegian Public Roads Administration is looking into the option of continuous bus lanes through intersections, which would improve the efficiency of public transport. Stops will be refurbished to a high standard and quality. 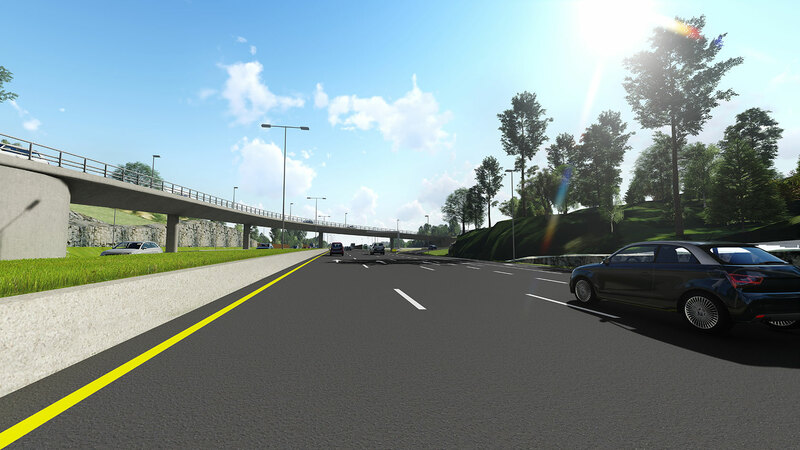 It is also looking into the possibility of allowing heavy traffic (over 7.5 tonnes) to use the inbound bus lane. We are assessing a range of solutions for the intersections at Klemetsrud, Mortensrud, Skullerud, Abildsø and Sandstuveien in order to improve traffic safety. 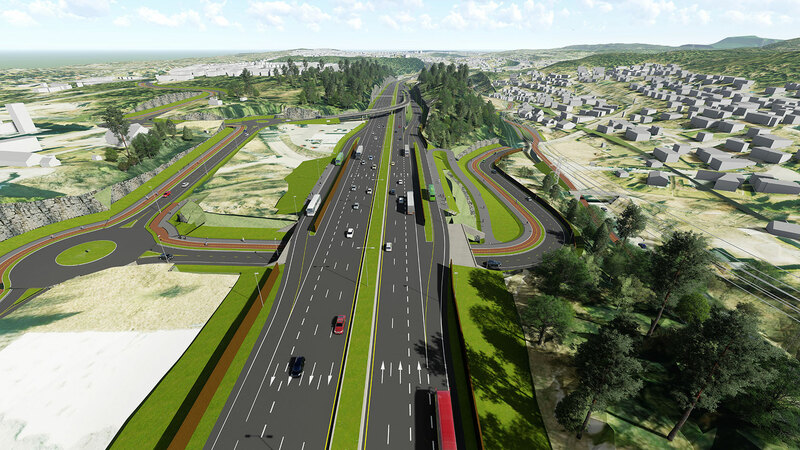 An express cycleway will be built parallel to the E6 between Klemetsrud and Ryen. The cycleway will be 4 metres wide with a yellow centre line. There will also be a 2.5 metre footpath. 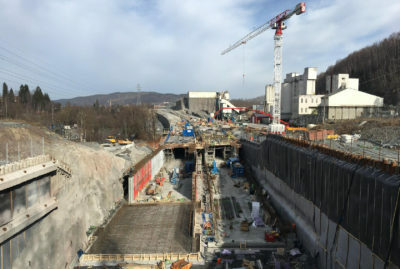 North of the Abildsø intersection (Lambertseterveien), the E6 and E18 will separate before the new tunnel portal for the new E6 Manglerud Tunnel. 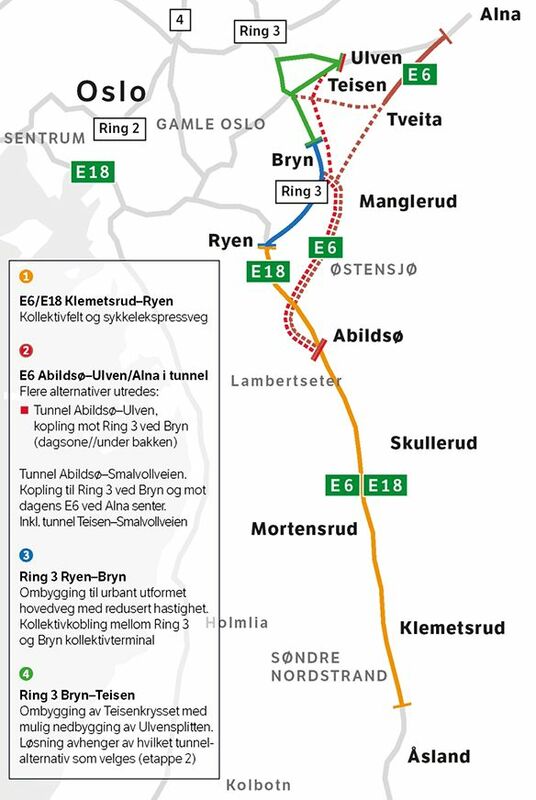 E6 Abildsø–Bryn/Ulven/Alna: We are looking into various alternatives for the E6 Manglerud Tunnel. 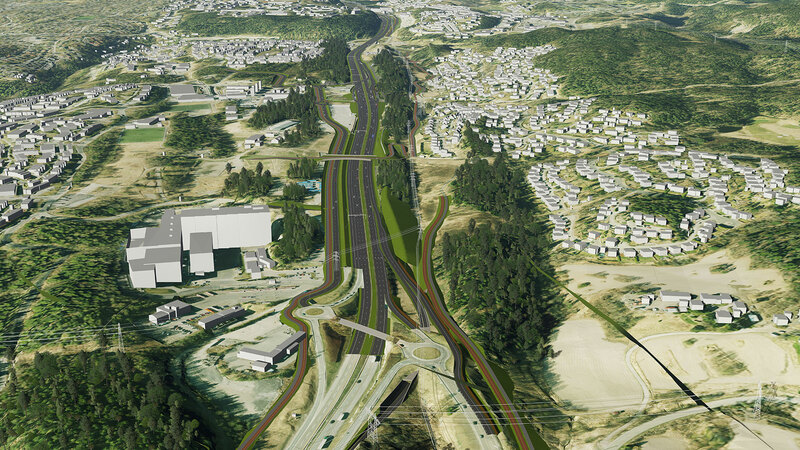 The project includes the development of a main road system and a connection to Hovinbyen. Hovinbyen is an area in which Oslo municipality is carrying out extensive urban development. 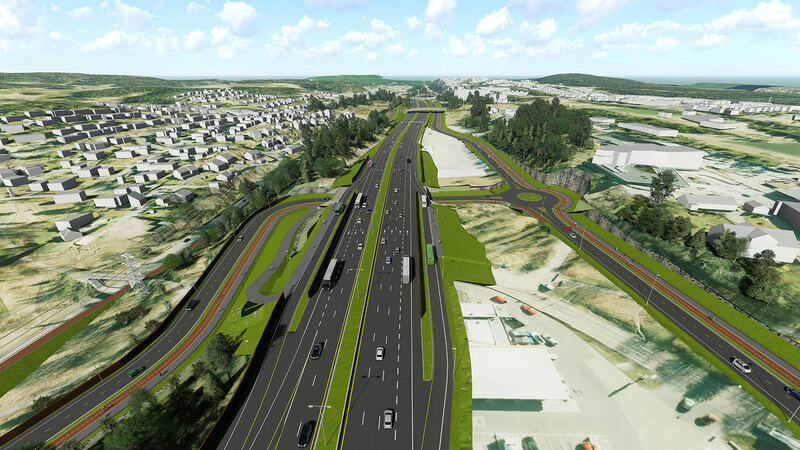 The preparation of the preliminary project/general planning for the road system, environmental impact assessment for the entire project, and detailed zoning of Stage 1 would start in the spring of 2016, and continue until 2019. The zoning plan for Stage 1 and environmental impact assessment are expected to be submitted to Oslo municipality’s Agency for Planning and Building Services in the spring of 2019, with consultation and public review in the autumn of 2019. Zoning plans for stages 2-4 are scheduled for submission in 2020. 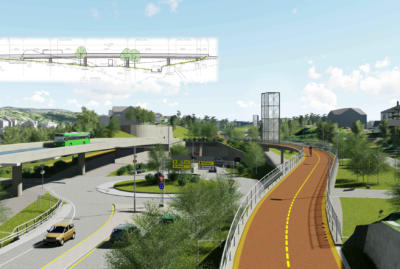 The project is prioritized in the Oslo Package 3 (O3) and the National Transport Plan (NTP 2014-2023). Stage 1 of the project is prioritized with start in the period 2022 - 2027.